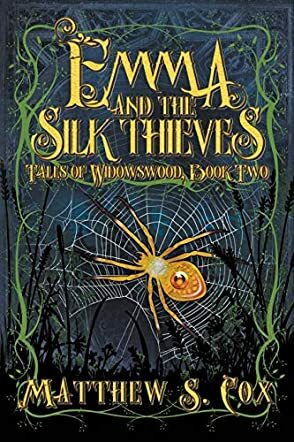 Emma and the Silk Thieves by Matthew S. Cox is the second book in the Tales of Widowswood series and it picks up from where Book One, Emma and the Banderwigh, finishes. Emma, the protagonist in the story, is a ten-year-old who lives with her parents, brother Tam, and her Nan in a small two-bedroom house. Emma is a druid like her mother and Nan and she has magical powers which can be used when she needs them. These powers help her handle many difficult situations. In this story, Emma has promised to go to Widowswood forest and collect silk from the Spider Queen and bring it to Marsten. Though she did not want to go near the enormous green spiders, Emma has to keep her word. The Spider Queen speaks about the problems spiders are having. Will Emma be able to solve the problem of humans hunting spiders for silk? Will the spiders keep their word and quit troubling humans? The story is wonderful and, like the previous book, has magic, fantasy, adventure, suspense, and action along with new creatures, magical characters, and different situations. Emma’s sense of duty, the risks she takes to meet the Spider Queen, and her maturity in handling the difficult situations will make young readers love her as a person. Emma's journey through the forest to meet the Spider Queen is enchanting and magical and the author pulls readers into the story with his vivid portrayal of scenes, detailed descriptions, well sketched characters, adventure, and action. This series is definitely a must-read and a must-have in one’s personal collection, and it can be enjoyed by adults as well.